It’s been a long hard struggle whether to share my little-known gem with everyone else, for fear of everything from overcrowding to driving up prices. But oh well, in the spirit of “Goods things must share”, I decide to disclose one of my best-kept secrets – Padma Hotel Bandung. Padma Hotel Bandung may not be well known outside of Indonesia but it is probably the best hotel in Bandung, a city described as the “Paris of Java” and popular with the Jakarta elite. Perched atop a cliff with commanding vistas of the valley below and the surrounding hills, it is hard not to feel like you’re in paradise, especially when it feels like the air-conditioning is turned on perpetually… outdoors! In case you are unaware, Bandung is a perfect getaway from the sweltering tropical heat with its cool weather, thanks to its higher elevation. 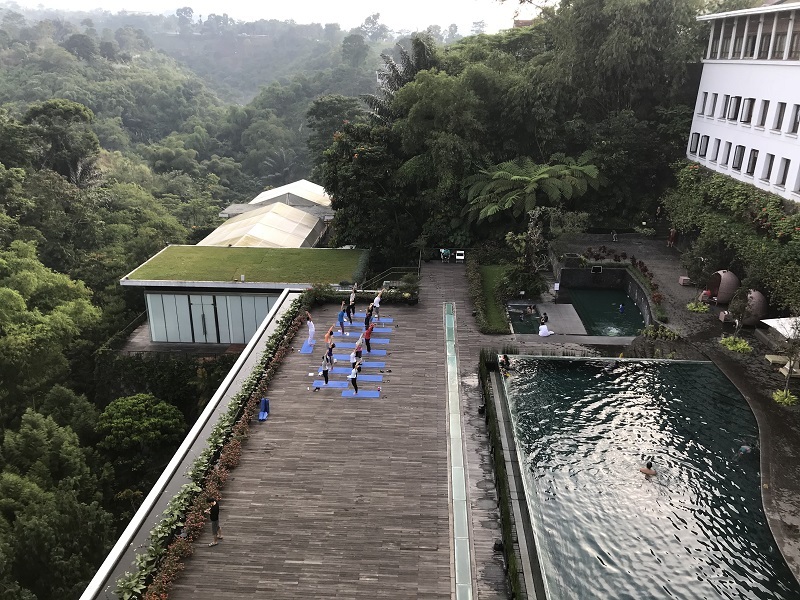 Guests rise early for poolside yoga at Padma Hotel Bandung. You know how whenever you ask hotel staff for recommendations for the best eats around town, self-serving staff often point you to one of the restaurants in the hotel and you get all sceptical? When the staff at Padma Hotel tell you the same, they’re really not kidding! 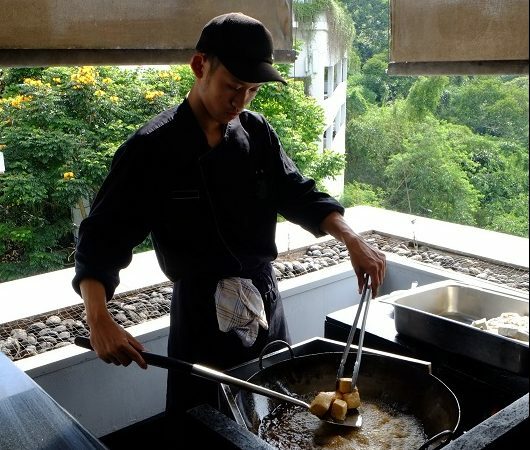 The restaurant at Padma Hotel is listed as number one out of the 1,723 restaurants in Bandung on TripAdvisor. No branding is even needed and it’s simply called The Restaurant. 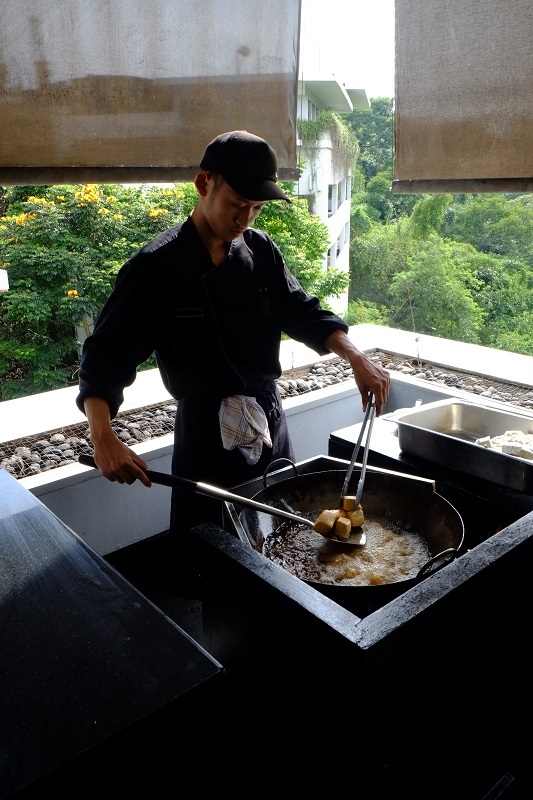 Here’s another tell-tale sign of how good the food at Padma Hotel Bandung. 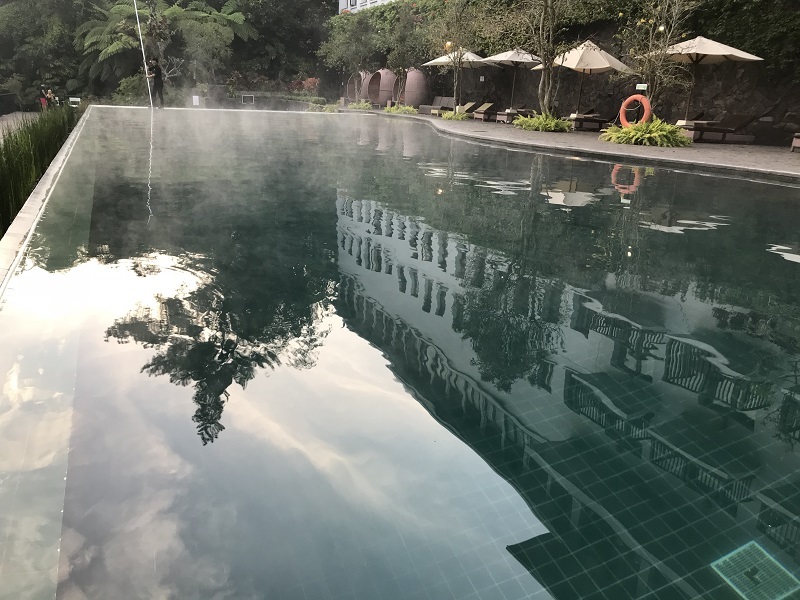 Hotel guests usually leave the hotel during the day to explore places outside and Bandung is not short of such activities, being blessed with volcanoes, hot springs, artsy cafes, etc. However, at Padma Hotel, tea time is such a highlight that guests schedule their activities around it and the restaurant gets even busier than during dinner time. Padma Hotel Bandung serves these local delights during afternoon tea, which is included in the room rate. The afternoon tea here is included in your room rate and comes with a variety of local delights rotated daily. 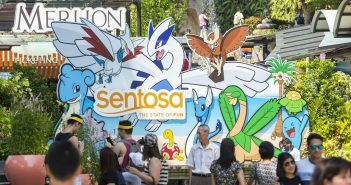 The clear crowd favourite is the legendary Tahu Susu (milk bean curd); the long queues for it at tea time is a testament to its popularity. The Tahu Susu is made with milk instead of soy, rendering it so silky smooth and soft on the inside and a nice thin crispness on the outside. You would almost understand and forgive the person in front of you who took ALL of the last six pieces and leaving you waiting for another freshly fried batch. The incredibly irresistible Tahu Susu is a must-try at Padma Hotel Bandung. Another popular tea time treat is the Goreng Pisang (banana fitter). What is unique is that here, the Goreng Pisang is eaten with chocolate rice, cheese or fine brown sugar. I know it sounds deadly and I’d have never thought of eating Goreng Pisang in any way other than on its own. But having tried this, I’d say the Indonesians really know what they’re doing. The brown sugar option, in particular, is exceptional as the crunchy sugar crystals complement the banana perfectly. With Kue Ape, one is never enough at Padma Hotel Bandung. Kids go crazy with delight when they realise ice cream is part of the breakfast buffet. 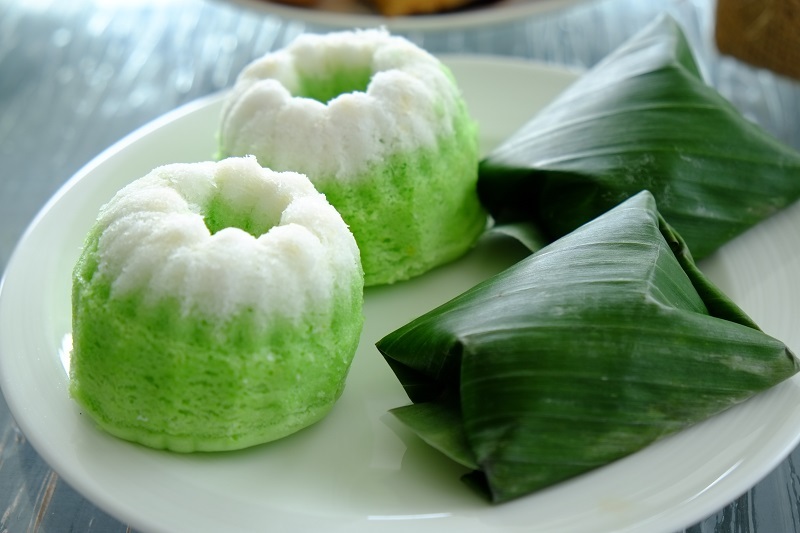 For me, I go crazy every morning over the Kue Ape with its crispy wafer-thin edges and chewy centre. The Bubur Hitam (black glutinous rice porridge) is, without a doubt, authentic as well. 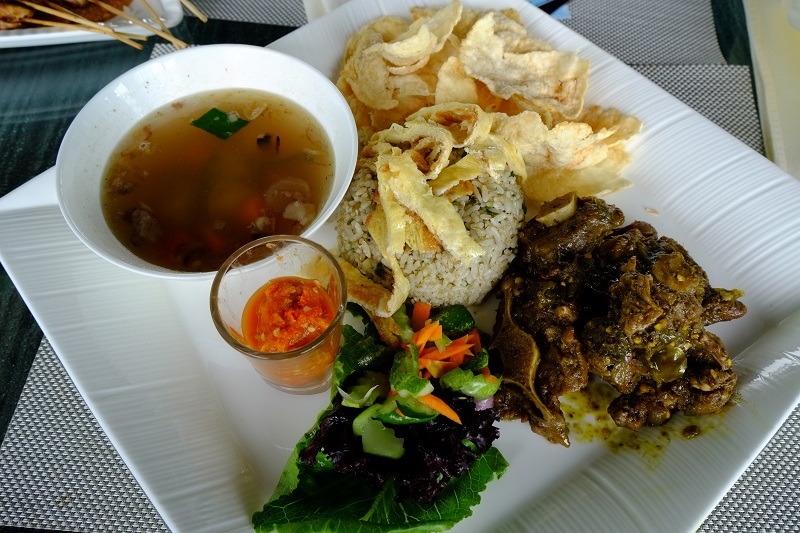 One of Indonesia’s favourite dishes, Sop Buntut (oxtail soup) also features prominently on the menu at The Restaurant. I, too, highly recommend the Nasi Goreng Buntut Cabe Hejo. I’m not one to snack on chips but the melinjo crackers that come with the dish are so addictive. The incredibly sedap and spicy Nasi Goreng Buntut Cabe Hejo is not to be missed. 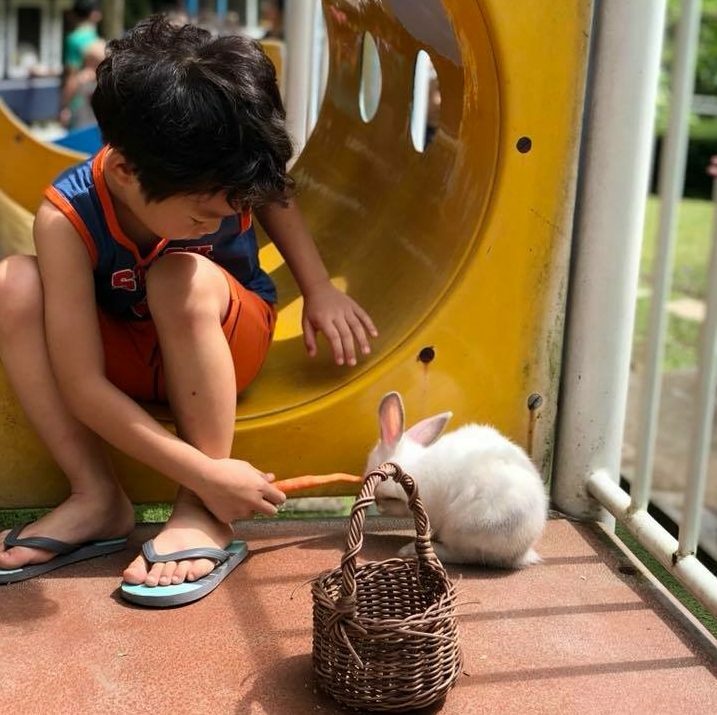 Kids get to get up close with bunnies at the petting zoo at the hotel. Need to burn off some energy after all that feasting? 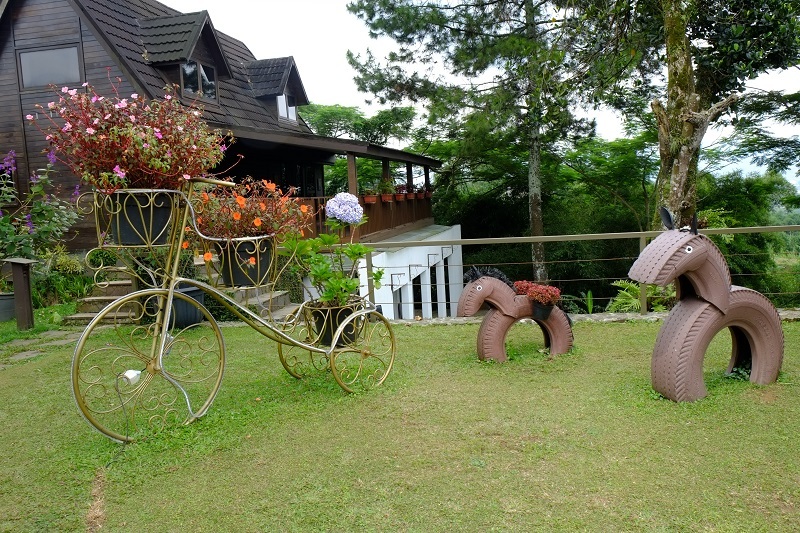 Padma Hotel Bandung is not short on activities, with facilities for basketball, soccer, mini golf, yoga, rock climbing and flying fox amongst others. 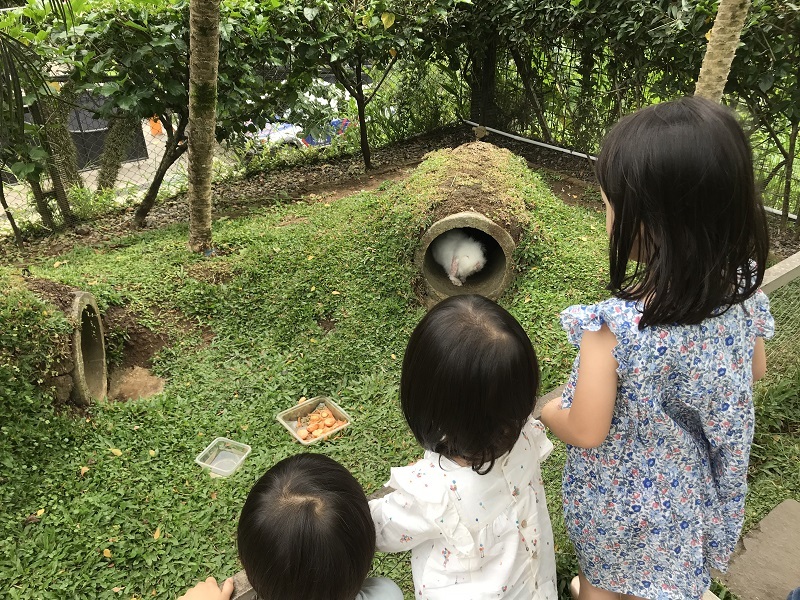 A family resort at heart, the hotel comes with its own petting zoo that is a hit with the kids. Children’s activities involving different types of arts and craft, including even batik painting, are organised by the hotel twice a day to keep the young ones meaningfully occupied. They can even take a horse ride just outside the hotel! 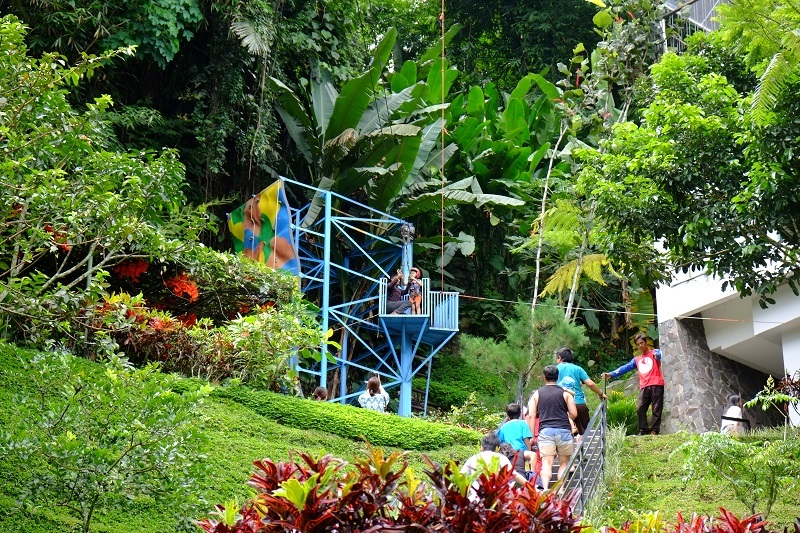 Flying Fox is a big hit with kids at the resort hotel. There are not many places in the world where kids would be allowed to go swimming at 5.30am in the morning without parents fearing they’ll catch a cold. Here, the heated pool assuages all such fears and you can see guests enjoying the pool even late into the evening. Check out the steam from the heated pool! Although not a commonly highlighted feature, the build quality of the hotel is excellent, particularly its soundproofing. We had a mini mayhem caused by my toddler’s fall from the bed with deep gashes in his head but our friends in the adjoining room didn’t even sense anything amiss! Good soundproofing might not sound particularly noteworthy, but when you’ve stayed at hotels where you can tell, ahem, everything that goes on in the neighbouring room, you get to appreciate such finer points. Perhaps more than anything else that keeps me coming back time and again is the unmatched level of service that I’ve not experienced elsewhere. The roving team of guest relations officers, in particular, a perpetually cheery Ibu Eka, never fails to make us feel welcome. During our first stay, one of our travelling companions casually remarked to the hotel staff that she really liked the roasted honey sweet potatoes, a local delicacy. Lo and behold, upon checking out, one of the young staff named Pak Rinaldi had two boxes of them waiting for her, and refused to accept any payment for them! 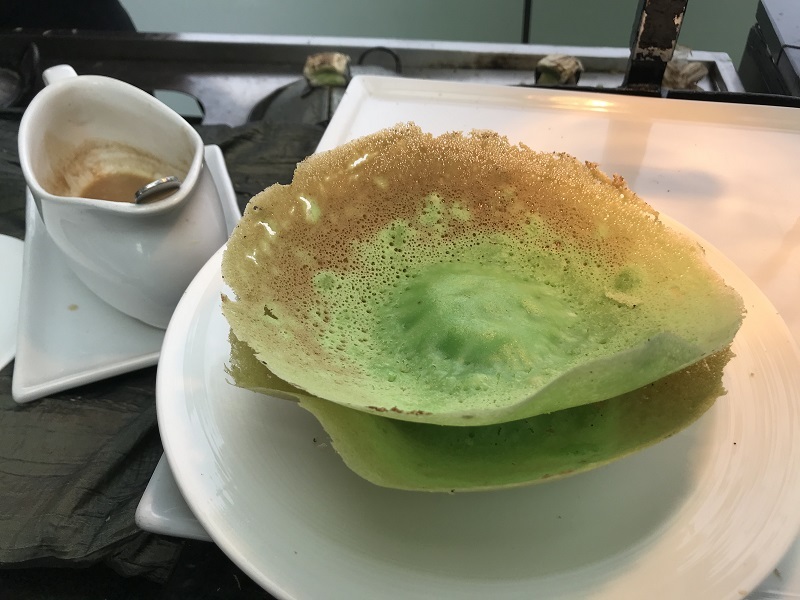 When my wife asked the hotel staff where she could purchase them during our second visit, we found them sent to our room one afternoon piping hot on a plate! 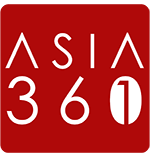 Indonesian hospitality is legendary, but this was really next level service. Did I also mention that airport pick-up and drop-off is complimentary? Why do I need to step foot outside the hotel if it’s so all-encompassing? You don’t! I always advise friends that you never need to step foot outside the hotel with its myriad of activities. If however you fancy taking your chances outside, there are volcanoes and hot springs to visit, strawberry farm, floating market, outlet shopping, etc. 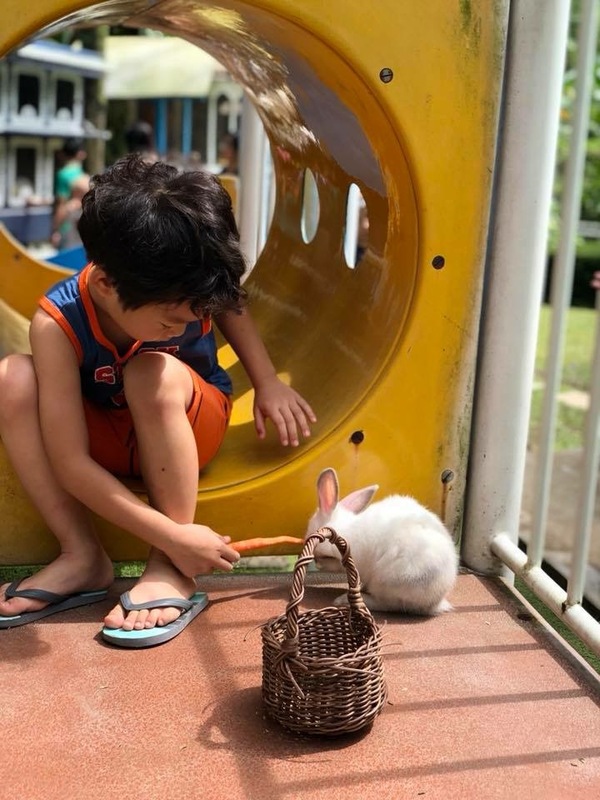 Rabbit holes with rabbits in them at Miss Bee Providore will keep your kids entertained. 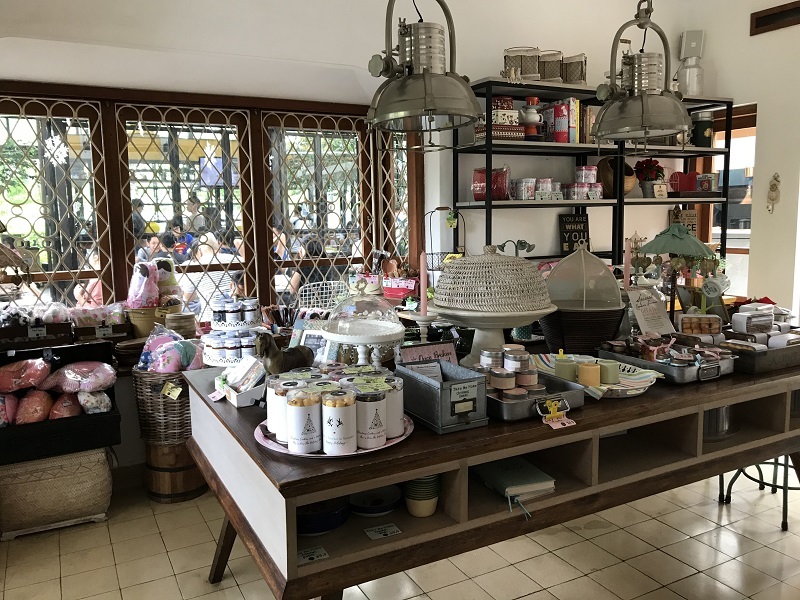 The famous Miss Bee Providore, a cool café/restaurant, is a very short walk from Padma Hotel and features a number of play areas for kids, a retail space and even its own rabbit hole (yes, literally rabbit holes with rabbits in them). There are lots of good food here, and judging by my friend who wanted to return just for the coffee, great Java too! Miss Bee Providore has a whole range of merchandise for sale. Another lunch option worth highlighting is Burgundy Dine and Wine. The food here may not be as exceptional as those of The Restaurant but the restaurant is shrouded in mist set high atop the hills with a sweeping view of the valley. Set up in the style of a vineyard restaurant, you get a sense of being momentarily transported to central France. The owners have creatively made play equipment out of recycled car tires and there’s even a trampoline for the kids. Let’s try to keep this club a bit exclusive and not start telling your Sixth Grand Aunt, Third Uncle and your cousin’s friend’s neighbour about it ok? Editor’s note: This is not a sponsored stay and the writer paid for all his own expenses.